Jean Conway, exiting president of Eastfield, remembers the first night the college began recruitment for the early college high school. It’s one of her fondest memories. Talking about it causes her eyes to well up with tears. Parents rushed into a high school auditorium, pushing strollers and holding babies. Most didn’t speak English. All were looking for a way their high schooler could have a better life. 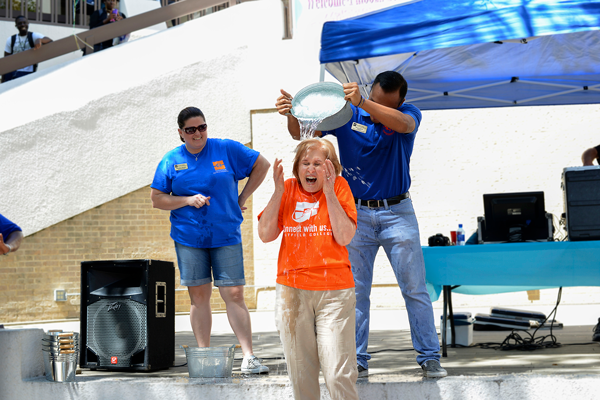 It’s one of Conway’s favorite memories from her time as Eastfield’s president. Now, as she passes the reins on to Eddie Tealer, Conway’s thoughts are a mix of memories and plans for her retirement. This year marks the end of her reign as “Queen Bee,” which started when she became interim president in 2009. Her career in education started as an academic adviser and adjunct English professor. 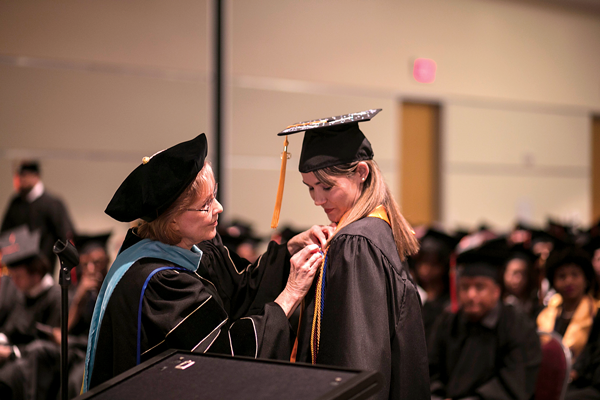 She did that for four years before gaining a full-time faculty position, where she focused on teaching international students and students who had just finished English as a second language classes. Her 10-year career as a professor ended when Stephen Mittelstet, at the time the president of Richland College, recruited a reluctant Conway into an administrative position. She would head up a new world languages and culture division at Richland. Mittlestet gave her one night to think about it. He would later recruit her to be vice president of academic success at Richland and then encourage her to become interim president of Eastfield. She wasn’t given much option in that case. “He said, ‘I think you’ll be good in the position. I don’t think you really need to think about it,’ ” Conway said. She was unsure each time she accepted a new administrative position. She loved the work she was doing as a professor, then as a dean, and later as a vice president. She was again uneasy in accepting the interim president position at Eastfield, but when then-chancellor of the Dallas County Community College District Wright Lassiter Jr. made it possible for her to pursue the permanent position, she gladly applied. He changed a rule stating that interim presidents could not apply for the permanent position so she could have the job. “I didn’t want to leave behind the things we had started,” Conway said. She hasn’t regretted a thing. Each new administrative position was a unique transition, but she learned to love each role. Every graduation and the start of every semester are special moments. So is the time Sharon Cook, assistant to the president, stepped out of a meeting and came back in whispering that she just received a call from the president. “Which president?” Conway remembers asking in a hushed voice. “Of the United States?” Conway asked, suddenly not whispering. All eyes in the room were on them. President Barack Obama’s visit was a crazy time. Secret Service came to campus, but Conway wasn’t allowed to tell the college why. A White House staffer suggested they paint dead plants that would be on campus instead of planting new ones. “There’s a color at Sherwin-Williams now called Eastfield Green,” Conway said with a laugh. And then he arrived and spoke. It was a surreal experience, Conway said. And the painted plants looked good on TV. Conway has paid attention to aesthetics since she first arrived at the school. She’s also always taken extra care to pay attention to students. One of the only times she can remember overruling a decision by advisers, deans and vice presidents happened when a student came to her with a request. She decided to let a student with a potential scholarship to Southern Methodist University skip prerequisites and take a class he needed. The math he wanted to take was a requirement for the scholarship. The problem was the Accuplacer test said he wasn’t ready. She listened to him. He told her he would work hard. He was passionate about his education. So she allowed him to take it. “I’ll make you proud,” he told her on his way out of her office. A couple years later, he showed up with a bouquet of flowers, dressed in a suit, to thank her. He passed the class, got his scholarship and graduated SMU with a business degree. Now he was working in a bank. To many, Conway was a great president and savior to the college. She arrived when Eastfield was on accreditation warning from the Southern Association of Colleges and Schools and corrected course in time to protect the institution’s reputation. She always saw credit the successes of Easfield as not simply hers, but the success of the whole community that came together to make it possible. Cook, assistant to the president, said Conway was more than just a supervisor. She is a lifelong friend. One of her favorite times with Conway was driving around working with Conway on the look of the school, specifically putting up the letters on the F building tower. The “Eastfield College” sign, visible from Interstate 30, were not always there. Conway saw the opportunity to show off the college and get more name recognition by putting its name on the tower. Cook got emotional remembering the bonding she felt with Conway when they made out-of-state trips to watch Eastfield sports teams. The two would bring back maple treats for anyone who couldn’t go on the trips and got to see student athletes enjoy their time in a different state. When the now-former president announced her retirement, Cook said she considered retiring with her. It was something they had planned, but Conway told Cook she didn’t think it was time for her to step down yet. But because of the trips and their time working close together, Cook is certain they will stay in contact. Conway was honored Oct. 12 in a bittersweet Fun Friday event. Erbin Ayala, academic adviser for first-year experience, said he would miss Conway’s presence on campus. Conway frequently attended campus events and spoke with students in the hall. 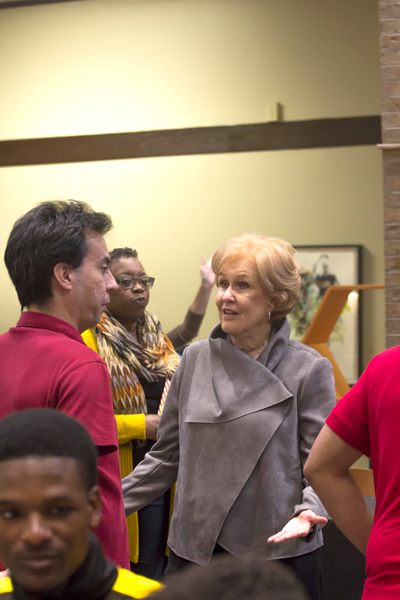 Conway’s involvement on campus and speed to address issues is something English professor Rufel Ramos said she would remember about her time as president. She also had other initiatives. From adding motion sensor lights to save energy to improving recycling, sustainability was one of Conway’s biggest passions. She also replaced trees on campus after a root-based disease killed most of them. Michael Brantley, head of facilities, and Terrance Wickman, sustainability coordinator, were major players in those efforts, Conway said. She is also proud of improving communication between employees and students at Eastfield through marketing, events, posters and occasionally an email directly from her. Before she arrived, everything was simply emailed and employees who missed the emails felt left out or neglected, she said. Conway has plenty to keep her busy. She and her husband manage rental properties, and she wants to spend more time working with residents. She wants to take some of the skills she used remodeling the college and use them to decorate her new home. And she wants to spend time with her grandchildren. One of her grandkids, the eldest, is 19 and in college. The youngest is 3 months old. She keeps their pictures in her new temporary office and longs to visit them. Her time as a college president has made it easy for her to give advice on college and education. It can be a frustrating thing to watch, Conway said. She knows about the inner workings of higher education and wants to tell them everything. As she moves from one part of her life to the other, Conway will have some figuring out to do, herself. Conway’s retirement will start with some leisure time and trips with her husband, she said, but she won’t stop working. She expects to become involved with some boards or charities and stay active.